Are you a Метро fan? Have you ever wanted to see the ornate artwork in the Northern Star of the largest country in the world? See here for a great article about the most remarkable stations of the Saint Petersburg Metro Subway system. But today’s blog edition is about another great way St Pete’s Metro is bringing art to people. 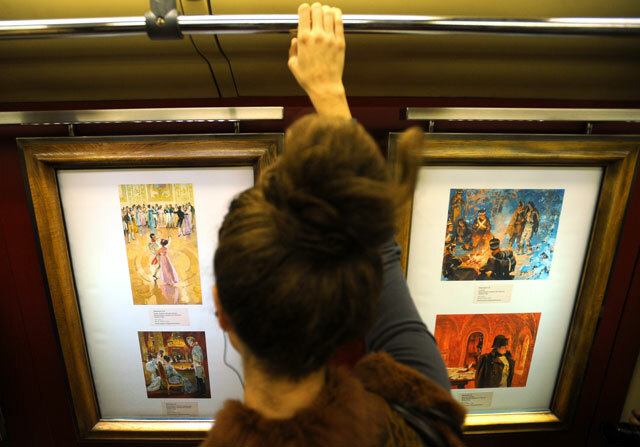 Metro has decided to add a train car named “Watercolor” with an art exhibit so that many people who get caught up in the daily commute/work/boredom routine would have art come to them. In fact, there is a photo-essay on a search engine Rambler depicting the way that the exhibit was incorporated in the train car. All the credits go to Rambler.ru and TassPhoto. 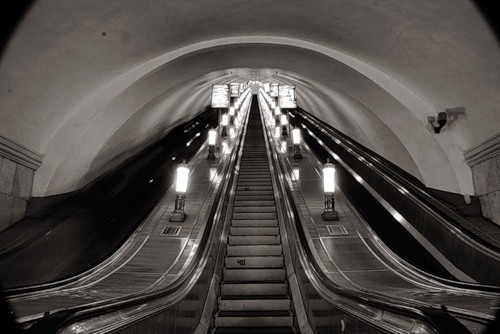 And below is a photograph one of photo-bloggers has put up on YandexFotos, depicting what Metro is for him: dark lines, descent and ascent and movement. His metro-themed shots are here. Check these out and make sure that you include Saint Petersburg Metro on the list of places to definetely check out while you’re there!